My earlier Flex blogs often talks about Flex in combination with java but you don't need to java you can use Ruby on Rails too. There are a lot blog entries how to do this. I already made a little demo application where I use RoR and the HttpService in Flex. This solution is based on REST Web Services. RoR gives xml as output. In this Blog entry I will use RubyAMF. With RubyAMF I can use RemoteObject, RubyAMF will convert the Ruby datatypes to the Flex datatypes and it is really fast. Let's create a new Flex Ruby application where we will use RubyAMF. I will create a small comic entry application. Edit the database connection file ( comics_catalog\config\database.yml ) with the right connection. This will download RubyAMF code and configuration from subversion to your project. Edit the comic table configuration. Go to comics_catalog\db\migrate\ folder and edit the 20080827214400_create_comics.rb file. You will have an other filename because of the timestamp. The script need to look like this. The last step in RoR is to configure RubyAMF. For this we need to go the comics_catalog\config folder where we will edit the rubyamf_config.rb file. I use ClassMappings.ignore_fields because I want to ignore the automatic created fields Ruby will fill these field automatically. ClassMappings.translate_case is important if you want to Java naming style. RubyAMF will convert created_at to createdAt. ClassMappings.assume_types is important if you do your know class mapping. In our case we will create the comic class in Flex too so we don't need this. This will give us a little more performance. 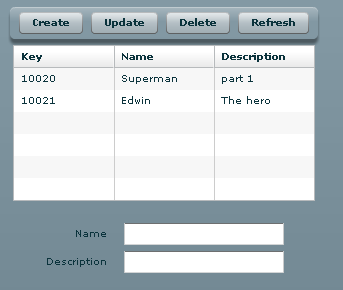 ClassMappings.register(:actionscript => 'Comic'. Don't use the package name just put in the actionscript class name. Now we can go to Flex, where we create an new application. And here is the mxml code. With Actionscript 3 and Flashplayer 10 you can now use the new FileReference features. 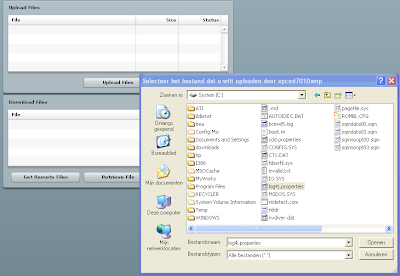 For example you download and upload a file with RemoteObjects ( Blazeds / LifeCycle ). In the early days you had to use a upload and download servlets. Here are some screenshots of the flex application. First we can upload a file. 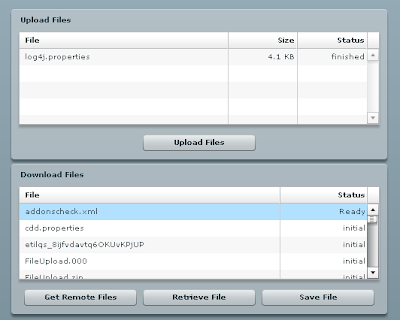 The datagrid show the status of the uploaded files. Off course we can download some files from a remote server. First we need to get a list of the remote files. For this we need to press the Get remote files button. We can select a file and press the Retrieve File Button. When the status is ready we can save this file by pressing the Save File Button. <mx:DataGrid id="listFiles" left="0" top="0" bottom="0" right="0"
<mx:Button id="btnAdd" toolTip="Add file(s)" click="addFiles()"
<mx:Button id="btnList" toolTip="List remote files"
Cairngorm is MVC framework which you can use in Adobe Flex or Adobe AIR. In Flex you can put all your code in one mxml but this makes hard to develop and maintain when the project has a particular size. Adobe has developed Cairngorm for it's own projects and it is very positif they released it to the opensource community. Adobe already released BlazeDS, so what's next? You can download Cairngorm from here. Here is a cairngorm example application which gives you a nice overview what Cairngorm does. This is a login application. Use admin as username and password. In Flex you can put all your code in one mxml. Off course this works perfectly but is not easy to maintain and all the components are tidely connected. The Model View Controller design pattern can help you to split up the flex application so we have loosely coupled and cleaner components. These components can be easily reused without breaking up the whole application. With MVC design pattern helps you to make a big flex application without having a code nightmare. Here is an example of a simple mxml application where the label get it's data directly from the list. 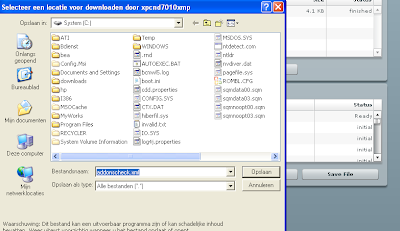 Let's change this Flex application in an Model View Controller application. I know this is an overkill for this example but in the large application you will benefit from this approach. Create an new component List1 in the new folder view. Do the same for the Label and name this component Label1. Store Label1 in the view folder. We can use these components after adding a namespace to the application mxml. This time we have the same application but there is no interaction between the components. We can change this by fire an event when the list is changed. This event can be captured by the controller which stores the new list value in the model. Events make these components loosely coupled. The label component can retrieve the new list value from the model or actionscriptcan monitor the list value of the model so when it is changed, it can update a local variable. Create a new event and fire this event when the list component is changed. Let's create a new actionsript class ChangeEventClass which extends from Event. Store this class in the event folder. We want to pass the new value of the list to the other classes. So we need to build a custom event. Now we can change the list component where we use the change property to fire the new event. It is very important to set the bubbles parameter to true else the Controller class can not capture the event. Default only the parent component can listen for this event. We want to capture this event and store the value in the model. Let's create the model first. The model has to be a singleton class so an other component can retrieve this value. Create a new actionscript class Global and put this class in the model folder. The listValue has to be bindable else we can not retrieve this value from the label component. The next step is to create a Controller class and put this class in the controller folder. In this class we will capture the list change event and store the new value in the model variable. The application mxml will now look like this. We can import the Controller class to this mxml. We only have to change the label component so its retrieve its text value from the model class. Or we can listen when the listValue changes in the model class. Now we have a MVC flex application.